The Wonderful Cebu blog is a travel, food, lifestyle, and events blog administered by Thaddeau "Thadz" Engaling II, an adopted Cebuano who aims to showcase what Cebu has to offer through articles he writes based on his experiences around Cebu. What is the Wonderful Cebu blog all about? What does it aim to achieve? How does it plan to approach it's vision and goals? Read along to know the answers to these questions. The vision of the Wonderful Cebu blog is to become a trusted authority on information about Cebu, particularly on areas of Cebu lifestyle, dining in Cebu, hotels and resorts in Cebu, places of interest in Cebu, interesting things to do in Cebu, transportation in Cebu, celebrations in Cebu, sports in Cebu, services in Cebu, and events in Cebu. It aims to be a reliable guide for locals and tourists alike who wish to explore Cebu. Articles at the Wonderful Cebu blog are a mix of sponsored posts and non-sponsored posts. We indicate in the labels which ones are sponsored posts. We go around Cebu in search of blog-worthy experiences and won't mind spending when necessary and when within our means. On the other hand, we also welcome writing for businesses in Cebu who wish to be featured on our blog. All the articles will be written with our personal experiences as basis. No prepared articles are allowed on this blog. The Wonderful Cebu blog is divided into the following sections: Dining in Cebu, Hotels and Resorts in Cebu, Places of Interest and Things to Do in Cebu, Transportation guide, and Celebrations in Cebu. The Dining in Cebu section is a directory of restaurants, bars, and cafes around Cebu. A directory of hotels, resorts, pension houses, and other accommodation options in Cebu can be found in the Hotels and Resorts section. For a list on places of interest in Cebu and interesting things to do in Cebu, visit the Places of Interest and Things to Do page of this blog. The Transportation guide is a general guide to transportation in Cebu. Thadz's wanderlust is a product of many factors as discussed below. His wanderlust influences are due to his ancestry, family circumstances, opportunities afforded by his co-curricular and extracurricular activities at school, involvement in sports, and later on opportunities brought about by work and business. The paternal roots of Thadz are traced to the mystical island of Siquijor in Central Visayas. His maternal roots are of Ilocano and Negrense bloodline who somehow found their way to the Zamboanga Peninsula. During his infancy, Thadz's mother was still in school. So he had to be taken cared of by his grandparents at Siocon, Zamboanga del Norte where he spent his infancy and toddler years. Every summer during that time, he would accompany his grandmother in traveling to Cagayan de Oro City, Cebu City, and Tagbilaran City, Bohol. They traveled to visit his nuclear family in Cagayan de Oro and his aunts in Cebu and Bohol. Thadz was reunited with his nuclear family when he was six. That was when he started going to school at Montessori de Oro and Xavier University in Cagayan de Oro. During these summers, he would join family on 8-hour bus rides from Cagayan de Oro City to Zamboanga City. The bus would stop at Iligan City, Marawi City, Pagadian City, and Ipil town (formerly part of Zamboanga del Sur and now capital town of Zamboanga Sibugay province). From Zamboanga City, they would then take on a 10-hour ferry trip to Siocon. Siocon was a very remote rural place then. In June 2016, Thadz moved again. This time he flew more than 7,000 miles from Cebu to California. His new home is at Stockton, California, U.S.A.
Because of his involvement in co-curricular and extracurricular activities in school, Thadz also got to travel. His participation in the academic quiz contests allowed him to visit the Zamboanga del Norte towns of Sindangan, Manukan, and Sirawai. As a boy scout, he went to Laguna, Manila, Cebu, and Leyte. During his college years, his membership to the Facilitators' Circle brought him to various places around Cebu. As a passionate sports fan, Thadz also traveled to places to watch sporting events. Two of these events are the 2008 Philippine Collegiate Champions League held at San Juan City, Metro Manila and the 2011 Los Angeles Galaxy versus the Azkals Philippine national men's football team friendly game at the Rizal Sports Complex in Manila. Work also provided Thadz with plenty of opportunities to travel. As a guidance services specialist at the University of the Philippines Cebu, he took on official travels to Pagadian City, Ozamiz City, Dipolog City, Iloilo, Metro Manila, and Laguna. When he later decided to go full time as a team development consultant, Thadz traveled to facilitate team building and leadership programs in Bohol, Dumaguete City, Bacolod City, Bantayan Island, and Dapitan City. 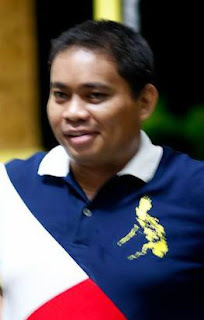 Thadz went to three (3) different schools for elementary education: Montessori de Oro and Xavier University in Cagayan de Oro City for 1st and 2nd grade and later graduated as class valedictorian at Siocon Central School in Siocon, Zamboanga del Norte. He moved to Cebu to complete his high school education at University of San Jose-Recoletos. Thadz would then earn his B.S. Psychology degree from University of San Carlos. He has graduate school credits from University of San Carlos and Cebu Normal University. After graduation from college, Thadz started out as a guidance counselor at University of Cebu, also handling trainings and job placement for engineering and education students. He would later move on to be a guidance services specialist and a student affairs officer at the University of the Philippines Cebu. After about seven (7) years at UP, he decided to work full time as a team development consultant and founded Cebu Teambuilding Services. He also had stints as financial adviser at Insular Life and Philam Life and was also an agency unit head at Maxicare Healthcare Corporation before he moved to reunite with his family in the United States in the middle of June 2016. Thadz is a man of many interests. The areas that interest him the most are sports (particularly basketball), travel, food, writing, team building and leadership facilitation, and meeting new people. You're doing great in promoting Cebu. Your articles are very helpful. Keep them coming!